Governments and international agencies tend to talk in millions when they discuss aid projects. 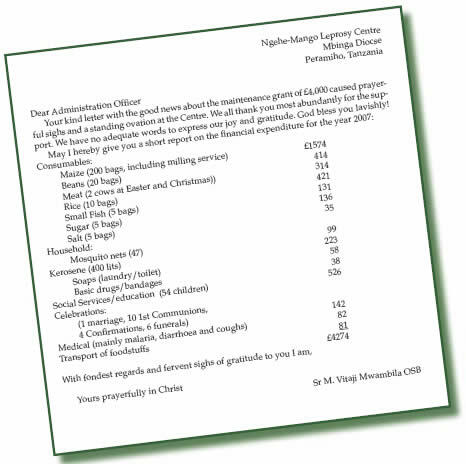 Sr Mwambila's report from Ngehe-Mango (Tanzania) helps put a perspective on giving to charity. Money goes a long way in Africa when it is wisely spent by thrifty managers, and what we may regard as modest sums can make a significant difference. Here is an example of a £4000 grant stretching to feed a Leprosy Centre for a year, as well as providing social services and education for the children, and even contributing to occasional family celebrations (local currency converted to £ sterling).